Chef Paul Albrecht brings a wealth of experience to re-invigorate the dining experience in Panama City. Panama City now has its own world class Master Chef Master Chef Paul Albrecht, The Godfather of Atlanta’s cuisine, (the name given to him by Zagat Magazine), has come to Panama City and the Holiday Inn to redefine what dining is in Panama City; but that’s not where his journey as a Chef started. Chef Paul’s Family has been in the business of making great food for over 200 years, his grandfather was chef to the Austrian Hungarian Monarchy in the 19th century. Before being named one of this countries youngest Master Chef’s, Chef Paul trained at some of the finest hotels and resorts in Switzerland. Since being in the U.S. he has hosted president George H. W. Bush and been featured on numerous shows such as Live with Regis and Kathie Lee, CNN, and others. Chef Paul, has always enjoyed the beach and the coastal areas of Florida. He met the Hilton Family, (Owners of the Holiday Inn Panama City) and Cody Khan, in the late 80’s – early 90’s when he opened a restaurant in Carillon Beach for a brief period of time, developing a lifelong friendship with them that is still strong today. When Cody called to ask Chef for his advice on how to re-invigorate the restaurant and bar in the Holiday Inn Panama City as part of the 5-million-dollar renovation project that was being done, he saw an opportunity to come back to an area that he loved dearly and take a step back from the day to day choirs of owning and operating restaurants and to still be able to do what he loves best, which is making great food and creating amazing dining experiences. 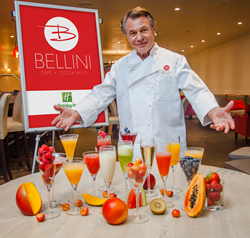 Now, Chef Paul is preparing to roll out new menus at the all new Bellini Café and Cocktail Lounge inside the Holiday Inn Panama City, starting with his own take on a Sunday Brunch Buffett. Starting July 31st, Brunch will be served every Sunday from 11:30AM to 2:30PM and will feature a host of Italian inspired, American breakfast favorites, including things such as, Gourmet French toast, eggs benedict, made to order omelets and much, much more.